When I heard Lucky Clan was releasing a camera app for the iPhone I knew it had to be good. After all, this is the same developer that released the fantastic ArtStudio for the iPhone/iPod Touch and iPad. I also knew, based on ArtStudio, that this is an app that will be constantly updated with new features as time went on and well worth the money. In fact less than three weeks after the initial release and update has happened with more features added. Was I right about it being a great app? Read on. As I just mentioned, Top Camera is a camera app. 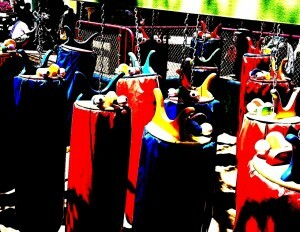 With so many camera apps in the App Store available for the iPhone you really have to make yours different and better. Top Camera does that by being packed full of features. It is almost like the developer took the best features of a bunch of apps and his own ideas and stuck them in a blender to get Top Camera. To start the I’ll talk about the camera itself. 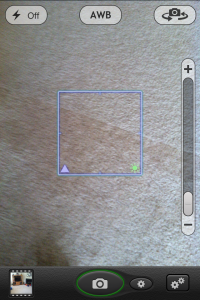 The interface is pretty standard and works like a camera app would be expected to work. You tap the shutter release and it takes a picture. you have your flash settings, zoom settings, etc. On the bottom right you have access to your library of photos that the app has taken. My biggest complaint about the camera itself is the shutter speed. It is fast, but when compared to Camera+ it lags. When I need to be constantly pressing the release for quick shots of capturing action it just doesn’t come close to the speed that Camera+ has. Even using burst mode (discussed below) is still slower. 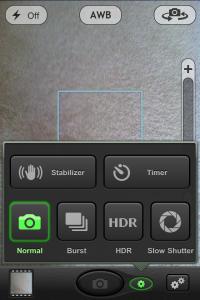 However, next to the shutter button is a little gear button which hides the picture options. You can choose to use HDR when taking a picture, image stabilizer, burst, slow shutter speed (the latest addition), and timed release. I am not a fan of HDR on any camera, and in order for it to work properly on the iPhone you have to have a really steady hand. I do like image stabilizer, but I am not a fan of it on the iPhone. It is not for one trying to catch a quick shot as the app waits until you are steady to release the shutter. 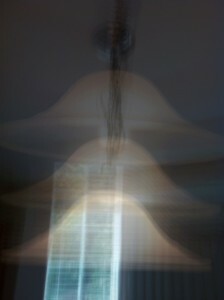 What is great in these features is burst and slow shutter speed. Burst takes a series of pictures as you hold the shutter release button down. It isn’t as fast as a DSLR (or the constant tapping of the shutter button in Camera+ that I mentioned earlier), but it does a pretty good job. Here is a series of photos I took on a recent trip to Sesame Place in Pennsylvania and tried the burst mode out on a roller coaster. I blurred out some faces of people and kids in the images. My favorite camera effect is using the slow shutter mode. This is fantastic. You press the shutter and have a few seconds to move the camera or subject (maybe a flashlight) to create some really cool effects. I can only imagine how great firework shots could look with this feature. After you take your pictures you can edit them right in Top Camera. All pictures are stored in Top Camera until you move them to your photos roll of the device. While in the app you have access to a fully featured photo editor. You can crop, edit contrast, edit saturation, etc. 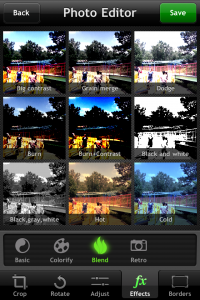 There are also 36 filters you can apply to your photos. So, if you think about it, you are getting two apps in one- a camera app and a photo editor eliminating the need for multiple other apps on the phone. The editing tools are very easy to use and I love the fact that I can do this right in the app and don’t have to import photos into another app after exporting them to my gallery. Another great feature of Top Camera is folders. You can actually organize your photos right in the app. It is almost like having iPhoto on your phone and albums. If you take a lot of photos with your iPhone this is a great feature for organizing photos before you can get them onto your computer. Other features of Top Camera include the ability to email photos from within the app, Dropbox integration (recently added), and more. Like I said- packed with features. At the current price of $.99 Top Camera is a steal. I am always looking for great camera apps to tell my photo students about. Top Camera will be at the top (no pun intended) of the list when school starts in the fall. If the shutter speed lag can be improved on this could easily be my only camera app on my phone.